Dealer Revealer is the world’s first and only electrical device designed to aid law enforcement agencies in detecting or locating mechanical hides and traps within motor vehicles. Mechanical hides can be tricky and are designed to elude government officials from locating and seizing narcotics and proceeds from drug sales. Hides have various designs, all of which vary depending on the creativity of the person constructing it along with the make and model of the car. You usually must do a sequence of events electronically in a car to open one, which is impossible unless you have first hand knowledge on each hide. Find non-factory wires in the vehicle and attach Dealer Revealer contacting clips to the wires. 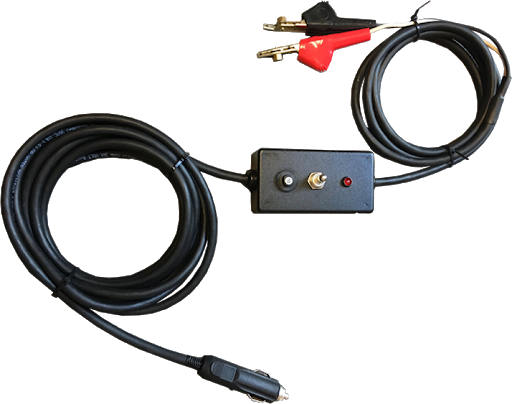 You apply power to the Dealer Revealer with the devices power source connector such as a 12 Volt outlet. Just toggle the Dealer Revealer power switch to open and close the mechanical hide or trap. Law Enforcement personnel usually have no idea where the compartment is until they supply power to the dealer revealer and then listen and hear what is opening or closing as they toggle the power switch. Designed by a law enforcement agent with simplicity in mind dealer revealer is the premier solution for government officials to efficiently locate mechanical hides and traps within a motor vehicle. Dealer Revealer is the world’s first and only electrical device designed to aid law enforcement agencies in detecting or locating mechanical hides and traps within motor vehicles.